Everybody deals with dehydration at some point, especially after exerting high amounts of energy. You become dehydrated when you lose more fluids than you take in. This is most likely to happen when you are active in a hot environment and fail to drink enough water. It can also be the result of an illness, especially ones that cause diarrhea or vomiting (x). If you lose too much water, then your body is no longer able to carry out its normal functions. When there are insufficient fluids in the body the balance of salts and sugars in your organs is upset (x). Mild dehydration can be treated by simply drinking more water (x). It’s best to drink small amounts, in short intervals. Drinking a large amount all at once can cause vomiting. Moderate dehydration can be unpleasant as it can cause dizziness and lethargy. If left untreated, dehydration can become a serious health risk, leading to seizures, brain damage and in the most extreme of cases, death (x). Anyone who does not drink enough fluids is at risk of suffering the effects of dehydration, but there are some groups of people who are at greater risk. Young children are prone to catching illnesses that cause diarrhea, which leaves them vulnerable to dehydration. Older people are also at higher risk because, as the body ages, it is not capable of maintaining the same levels of water in reserve. In other words, it is a lot easier to become dehydrated (x). Most cases of dehydration are acute cases. However, chronic dehydration is when you are suffering from the effects of dehydration for a long period of time. If left untreated, it can lead to conditions such as kidney stones. If you are persistently suffering from dehydration, then you should seek medical attention (x). Once you become moderately dehydrated, you may notice that your mouth and throat begin to feel excessively dry. This can make swallowing difficult (x). The lack of saliva in your mouth can you leave you with a sticky feeling rather than dryness. Thirst is not reliable as an early indicator of dehydration. If you are feeling excessive thirst, then you are probably already in a state of moderate dehydration (x). If you are feeling an extreme thirst then you should start by taking small sips of water. It may be tempting to guzzle down a whole bottle of water, but it is probable that this will lead to vomiting. When dehydrated, your body can decrease the volume of blood flowing in your body. Some of the water is removed and used elsewhere. This causes your blood pressure to increase, as your blood is essentially thicker than normal. This, in turn, reduces the flow of blood to your brain, causing dizziness (x). The insufficient flow of blood to your brain may also lead to the poor decision making that is often seen with dehydration (x). Feeling more tired than expected is one of the signs of mild dehydration. This happens for two reasons. Firstly, without the necessary levels of water in the body, your sugar levels become unbalanced, meaning that your cells don’t have enough fuel to function (x). The second reason is that as your blood volume reduces it becomes harder to transport the sugar to where it is needed to keep you going (x). If the fatigue reaches the level of listlessness, then this is a sign that the dehydration is severe and IV fluids may be necessary. When properly hydrated, your urine should be pale yellow in color. The more dehydrated you are, the darker you urinate will be. Once it becomes a muddy yellow and smells strongly, this indicates dehydration (x). The frequency with which you are urinating is another indicator of your hydration levels. If you are urinating less than normal, then you should consider drinking more water. Urinating fewer than four times a day is a sign of mild dehydration (x). When your body is running low on fluids, it begins to ration the use of water. Signs of this are the inability to produce tears or sweat. If you have been sweating due to heat or exercise, but then realize you have stopped, then you need to start rehydrating immediately. It is a large warning sign that you are on the way to serious dehydration. Plus, if you stop sweating, your body is no longer able to cool its self, which leaves you vulnerable to heat stroke (x). Young children are especially prone to dehydration, so it is important to be aware of the signs. When babies and infants are dehydrated, they exhibit drowsiness, an increased breathing rate, no tears when crying, sunken fontanelle (the soft spot on their heads) dark yellow urine or very few wet nappies and cold and blotchy-looking hands (x). If your young child has had diarrhea or is vomiting and is exhibiting the above symptoms, you should seek medical attention immediately as it could quickly become serious. For healthy adults, the main cause of dehydration not drinking enough water. The math is quite simple, if you have more fluid leaving your body than entering, then you will become dehydrated (x). This means that if you are doing anything physically active in a warm or hot environment, then you need to significantly increase your water intake. It should be noted that when it comes to hydration, not all fluids are equal. In fact, soft drinks have been shown to make dehydration worse (x). This is because the bubbles in fizzy drinks stimulate your bladder, causing you to urinate more frequently. For the same reason, caffeinated drinks should be avoided if you are looking to replace lost fluids. Whenever you have an elevated temperature, this increases the chances of becoming dehydrated. The higher the temperature, the higher the risk (x). The effect is amplified if the fever comes along with diarrhea and vomiting. In general, if you are unwell it is best to make efforts to remain well hydrated. This will prevent you from suffering from the effects of dehydration and will also aid in your recovery. Excessive sweating can be caused by several factors. It could simply be as a reaction to high temperature, the result of exercise or the combination of both. Sweating in itself is not a bad thing. It is vital for maintaining a healthy body temperature. However, it becomes a problem when the fluids are not being replaced (x). To protect yourself, simply carry a bottle of water with you if you know you might be at risk of excessive sweating (x). If you are suffering from vomiting and/or diarrhea, it can be easy to become dehydrated. It is necessary to drink more water than normal when you are suffering from these conditions because you are losing a lot of it before it even enters your system. Dehydration because of vomiting is a particular risk for pregnant women who suffer from hyperemesis gravidarum, or extreme morning sickness (x, x). If you are urinating more than normal and not replacing those fluids, then you are at increased risk of becoming dehydrated. Excessive urination can occur because of unmanaged diabetes. If you have type 2 diabetes, it is important to stay on top of your diet and monitor your fluid intake and output. Another reason for increased urination could be if you have consumed a diuretic. These are compounds that help you to excrete water. Some medicines act as diuretics, but so do some common foods. If eaten in large amounts, foods like ginger, parsley and juniper can lead to excessive urination and eventually dehydration (x). If you are suffering from mild to moderate dehydration, then it is important to rehydrate. You may automatically consider water and sports drinks as good options for rehydrating, but coconut water may be one of the best ways to rehydrate, especially after exercise (x). Coconut water is especially good for rehydrating because it is gentle on the stomach. It has been found that drinking coconut water when dehydrated triggers less nausea than plain water. The sweeter taste also makes it more appealing to consume (x). Mixing a couple of tablespoons of coconut powder into a glass of water is a great way to rehydrate after exercise. It is also a good option to try if you are suffering from nausea and need to try something different to keep yourself hydrated. To protect yourself from the effects of dehydration, your best bet is to carry a bottle of water with you. Most of us don’t drink enough water, and this is especially true when exercising. If you can get into the good habit of sipping water while you are exercising, then you will be going a long way towards protecting your health. There is a link between people who drink less water and people who have less healthy lifestyles in general (x). Drinking more water is an inexpensive way to start improving your overall health. Most of the symptoms of fever, diarrhea and vomiting can lead to dehydration. When you are sick, you should make a conscious effort to drink more fluids. Dehydration, if spotted early, can be easily avoided and treated. It is caused when you lose more fluids than you consume (x). 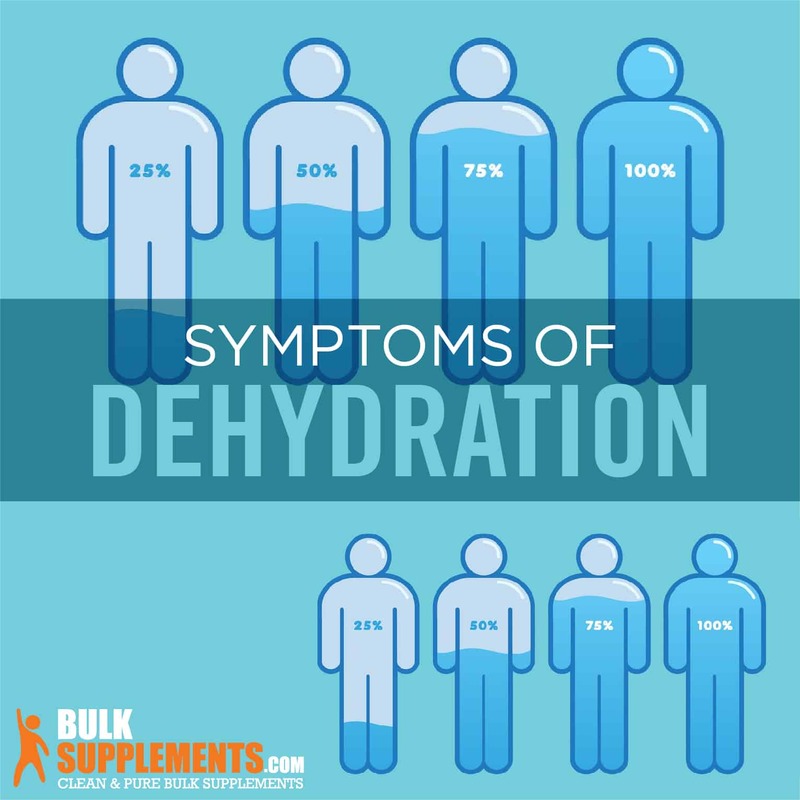 If you have the symptoms of dehydration, then you should take steps to rehydrate. Sipping plain water or coconut water are good ways to gently rehydrate. Avoid drinking too much in one go as this can make you vomit. To avoid dehydration, try to get into good habits of drinking water regularly. Adding coconut powder to water can make it more palatable and help you to meet this health goal (x). If an infant is showing signs of dehydration you should seek medical help immediately.